It’s sad that so many great names have fallen by the wayside, from Leak and Garrard in Great Britain to Micro Seiki and Sansui in Japan. The latter was one of the biggest Nipponese brands around in the nineteen seventies, with a proud portfolio of high quality, high end products with a distinctively svelte yet powerful sound. The Sansui brand still exists today, but the people responsible for the company’s classic amplifiers have long since gone. Founded in Tokyo, Japan, in 1947, it began life producing transformers but moved into amps and tuners, and made itself a fine reputation for both, especially the former. Sansui also built some very decent turntables – the SR222/II being a case in point – and matching cassette decks for this, arguably the brand’s most accomplished range. The series spanned the 217 to the 917, with the AU-317 being first ‘serious’ integrated in the pecking order. Think of it as a sort of Japanese A&R A60, and you’ll not go far wrong. 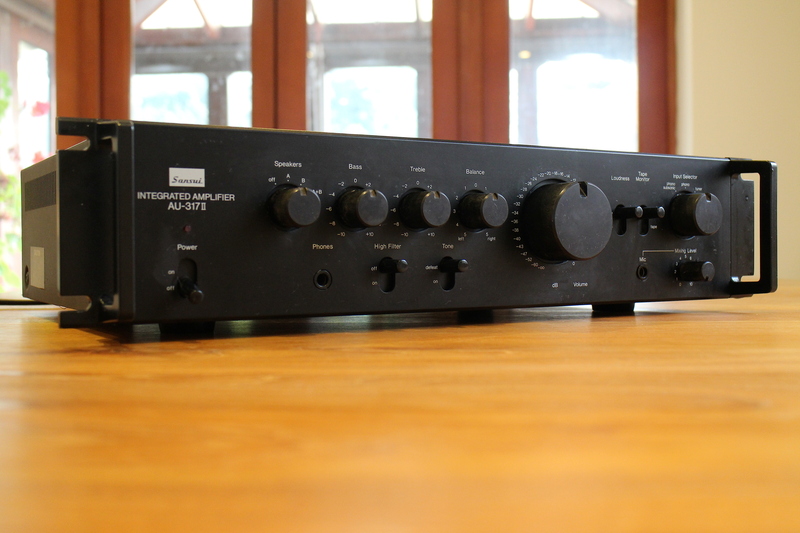 The AU-317 was launched in 1977, and featured crisp styling that has stood the test of time far better than Sansui products which preceded it, or indeed those that followed. Its black steel casework, matt black aluminium fascia and silky switchgear lend it a rather purposeful, almost military look. Optional rack mounting handles were rare, but add visual drama. Without these, it measured a fairly compact 430x110x340mm and weighed in at a not insignificant 9.5kg. The amplifier had a claimed 50W RMS per channel into 8 ohms, and many thought it was more in real-life conditions. Construction quality is excellent by the standards of the day; it has a complex and comprehensive circuit mounted on several circuit boards, with no less than 51 transistors, 25 diodes and 2 FETs. Two large ELNA smoothing capacitors loom large next to the chunky heatsinking for the four power transistors. Wiring is neat and everything meticulously laid out. The first version of the AU-317 was arguably the better; aside from its fascia labelling, it’s distinguishable by its black aluminium heatsink (the mkII version’s isn’t painted), preamp-out/main-in connectors on the rear panel (which were later deleted), shielded power transformer and slightly lower voltage power supply to the power amp section. The mkII version, launched in 1980, got a small hike in claimed power output to 60W RMS per channel, but little else. Sansui Electric Co., Ltd. is now part of Grande Holdings, a Chinese Hong Kong-based conglomerate, which also owns Japanese brands Akai and Nakamichi. The name still appears on modern budget hi-fi separates in some markets, but doesn’t share any real DNA with the AU-317. If you want to know how great it once was, then find yourself one of these late seventies lovelies; they’re far cheaper than you’d expect for such a well built and sonically capable product; mint examples go for under £150 and middling ones are far less than that. I enjoyed your write up of this fine little amp. I recently restored an au-317 (the first version) and was impressed with the build and layout. It’s the first 70’s amp I’ve come across with filter cap by-pass caps. It’s getting daily use and is proving to be a very *musical* amplifier, it surprises me at odd moments with a splash of deep bass or a ringing piano note that seems to come out of nowhere – in a good way. I am currently using my AU-317 II with Quad electrostatics. I was expecting it to sound horrible with such high end, revealing speakers but quite the reverse; it is proving surprisingly musical and quite gutsy too. It’s not the greatest integrated amp ever of course, but I can see why the press of the day were impressed by it. I take my hat off to you guys who can fix oldish HiFi amps. I have a AU317 MkII bought 2nd hand (£90 with ‘rack handles’) in 1980 – used it to drive a pair of home made floor standing ‘transmission line’ speakers based on KEF units (had to replace the ‘domed’ tweeters 5 years ago as 1 packed up), a Thorens TD160 deck with Linn arm. Output on one of the channels of the AU became intermittent over a couple of years (could solve it by flicking the power on and off or twiddling the phono/auxilliary knob), so I replaced it with what I though would be a comparable Cambridge Audio Azur 60 W same time the tweeters gave up. To my ears, the AU sounded better than the Cambridge, brighter/livelier sound verging on harsh if volume was cranked up (but it had a decent treble control so you could back it off easy enough), at low/intermediate volumes it was much preferable over the Cambridge. The Sansuii had an awful lot of use and got rough treatment / verging on abuse for all the parties/house/room moves, sub zero temps – it endured it all!. The cambridge audio packed up after 5 sedate years in one place (blows the 3amp fuse in the plug! ), – I never liked it much. I shouldn’t have bought it purely on the basis the manual suggests it should be left on standby using 15W 24/7 keeping the house warm – it doesn’t even have a on/off switch on the front. The sansuii had gizmos, loudness and tone controls and a mic input but in hindsight I figure they must have used decent components and put it together well for it to last so long. The Sansui I hope to get fixed some time, the azur hardly seems worth the expense of buying a special screwdriver to take the cover off to see if there’s any visible sign of whats wrong with it. Modest 40yr old HiFi technology beats hands down the overpriced cheap remote control modern stuff. CDs and MP3s made music mobile, tech improved PAs and TVs. HiFi amps just got more expensive without any noticeable improvement in sound quality.